MRS presents 'Tupelo Welcomes Elvis Presley Home' as a special Collectors Edition CD/Book which features Elvis' two historic concerts from 26th September 1956. It also includes scene-setting interviews with a 40-page hardback glossy book packed with rare photographs and new information on the recording of the concerts by radio engineer Ron Brandon. If you have never heard these historic recordings before they are a great insight into the excitement of Elvis performing live in 1956 and in front of a large crowd. Back in 1984 RCA released a vinyl box-set called 'A Golden Celebration'. The highlights were hearing the all-important Sun Studio outtakes, some delightful home-recordings plus the stunning September 1956 concerts of Elvis in Tupelo. In September 1956 Elvis was at his rock'n'roll peak and invigorated by the recent media excitement over his TV appearances. Elvis was already the major youth-driving force with 'Heartbreak Hotel', 'I Want You, I Need You, I Love You', 'Hound Dog/Don't Be Cruel' all hitting Number 1 and 'Love Me Tender' about to do the same with a million pre-orders. 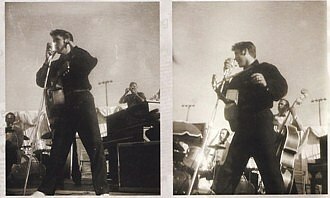 There was also the excitement Elvis felt returning to his home-town and performing in front of his parents. Tupelo was still only a small town of around 8,000 total population yet something over 15,000 people turned up that weekend to celebrate Elvis' home-coming. No wonder Elvis wanted to put on a good show! Early this year EIN was contacted by Ron Brandon the radio engineer who recorded the shows. With the help of Pamela May Decker we were able to reunite him with his Tupelo friend Charlie Watts after a gap of 53 years! Ron Brandon told us the fascinating story of how he came to record these historic concerts and this led to his involvement with M.R.S. and the release of this new CD/Book package. Fans should note that this is not a re-release of the classic 'Tupelo's Own Elvis Presley' DVD/Book which was produced for the real collector. Rather this is a nice little combo presenting these Tupelo concerts on CD in a stylish package that is affordable to all Elvis fans. I purchased it in the UK for under US$15. The book is hard-backed and its 40 pages all feature classic concert shots from both the Afternoon & Evening shows. The design is excellent and it also features 2 pages of rare candid shots. The book is a little larger than a regular CD but still sits easily on your CD shelf. It is nicely laid out and the photos capture the excitement of the weekend. 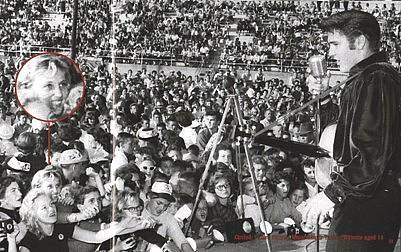 It also includes a fascinating image of a young Tammy Wynette (aged 14) (right) watching Elvis perform that afternoon. There are plenty of stories about Tammy Wynette being there during Elvis’ early years (see Scotty Moore’s book ‘That’s All Right Elvis’) so this shot is an interesting addition. The cover itself is a stylish design with an embossed-canvas feel. The CD also fits into a nice indent within the back cover. The text by Tupelo historian Roy Turner explains the background of the Presleys in Tupelo as well as Elvis' early performance at the 1945 talent show. It also tells the story of the home-coming concert and as Roy Turner succinctly writes, "Seeing the look on his parents' face, hearing the roar of the Tupelo crowd, he felt it could never be better than this. He was home." The book also features the story of how radio engineer Ron Brandon came to record these classic concerts (despite the wish of one Colonel Parker!) and how they came to be found and released by RCA in 1984. If you have never heard these historic recordings before they are a great insight into the excitement of Elvis performing live in 1956 and in front of a large crowd. The tape source is of course the same as on the 1984 ‘Golden Celebration’ box-set and so the same shrieking audience is just as loud and at times Bill Black’s bass & D.J Fontana are almost inaudible. The audio has been slightly improved but that is only due to modern audio processing as unfortunately only the one copy of Ron Brandon's tapes has been found. The Evening Concert (where unfortunately the start of the show is missed) is the real deal for having a much clearer audio quality, as well as being a little wilder show. Plus the addition of the fabulous song ‘Baby, Let’s Play House.’ The band is much clearer here, nice guitar work from Scotty Moore, and the screams less annoying. Elvis also adds a rockin' ‘Blue Suede Shoes’ to the setlist with the comment that the song is "getting kinda' old now." Looking back this is a cute little comment as, of course, Elvis would keep performing ‘Blue Suede Shoes’ until his last concerts in 1977! It also features a spectacularly crazy drum-break from DJ Fontana. I find the Evening show well worth a repeat play with Elvis begging "Would you please sit down" and the emergency announcements asking everyone to calm down, all adding to the great excitement. The bump and grind of the extended final 'Hound Dog' is fabulous. 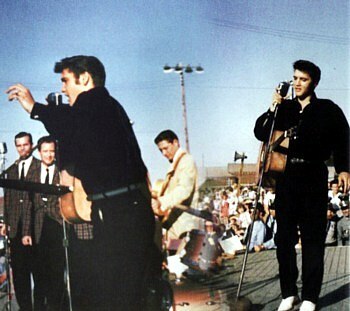 The Afternoon Show while not as listenable still captures the excitement of the day as well as the "Presentation of the City Key" to Elvis plus a fabulous 'I Want You, I Need You, I Love You' as well as 'Ready Teddy'. Elvis is in fine humour, joking about his success and teasing the audience. He comments about the sensational ‘I Was The One’ "It’s plum pitiful the way we do it." There are also the interesting scene-setting interviews with Elvis, Vernon and Gladys. It always surprises me just how young Gladys sounds compared with how you might imagine her voice to be. Finally a later 1957 WELO interview wraps up the CD with Elvis talking about road safety. Verdict: A lot of Elvis fans will never have bought the original RCA 'Golden Celebration' box-set and for them 'Tupelo Welcomes Elvis Home' is a chance to relive this classic and historic event. With the inundation of 'Public Domain' releases in the EU forever recycling Elvis' fifties hits in the same old cheap packaging this cute Book/CD package presents something new and shows how it should be done. At around $15 it's also great value for money and a cute Christmas stocking-filler! Note that with the release of the MRS ‘Tupelo Welcomes Elvis Home’ book/cd, Ron Brandon the engineer who recorded the concert sent EIN this message. 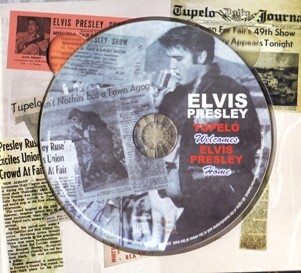 "I received the new Tupelo MRS release today and I am sure I am not the first to tell you that it is outstanding. And to everyone involved, I (and Charlie Watts) are indebted to each of you for finally making it possible for us to get a bit of recognition for being there way back all those years ago. I have sent one along to Charlie, and I'm sure he will be as impressed as I am. I am now really looking forward to my return trip to Tupelo next spring & meeting up with Roy Turner. Thanks again fellows... I really appreciate it. - Ron Brandon. For more Memphis Recording Service info go here. 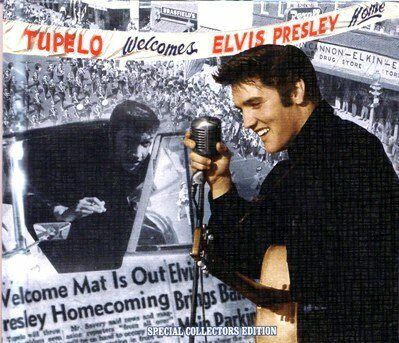 Tupelo Welcomes Home Elvis Presley. Special CD Collectors Edition featuring two concerts, rare interviews and a 40 page hardback glossy book packed with rare photographs and new information on the recording of the concerts by Ron Brandon on Elvis, two homecoming concerts in September 1956, Tupelo Mississippi. Venue: The Mississippi - Alabama Fair and Dairy show. Go here for other relevant articles. Go here to see EIN's in-depth review of the original 'Tupelo's Own' release - Now Sold Out.